This app constantly closes on me when I’m trying to read articles. It happens on more than 1 of my devices so I don’t think it’s a problem on my end!? App keeps crashing when watching live newscasts. This is a very poorly designed app. I saw that my data was near the limit this month and was wondering why. After marking when I would open the app along with time stamps from my mobile data, I found it to be a perfect match. Deleting this app after my review. App freezes constantly. You should fix it. I’ve never experienced an app that has dealt with as many crashes as this one. In addition, the news stories don’t always match up with their links. I’ll clink the link and it plays some a random news story not associated with the title. To many coincidences with advertisers to trust this app. With your new pop up ad I’m not able to actually view your app. When I open the app the pop up states to swipe up to access the article, but that doesn’t work, so there is no way too view. Prior to this the videos would not play, they would just show black screen. I’m truly surprised this has such high rating. Anytime I get a notification and I want to read up on the article it literally does not load. I constantly have to close out of this app and reopen it. And now they have pop up ads in the middle of the screen and what do you know the app freezes and I’m forced to close the app. Lastly the set up makes no sense it’s very hard to navigate and you don’t know if you’re clicking an ad or KARE11 content. Really hoping for some improvements. 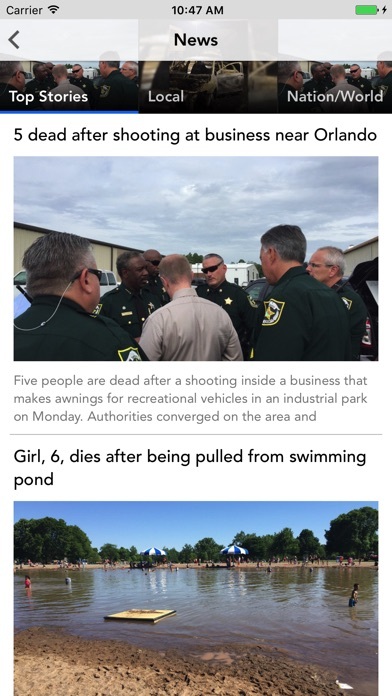 I use this app for news and have for several years. I agree with another reviewer it keeps getting worse with every release. I’m going to finally switch to another app because this one continually crashes as I’m reading a story. Don’t like the scrolling thru large photos to see next stories. Please revert back to previous version. Wish I hadn’t updated! Performance issues. Open the app and it freezes. Can’t scroll or anything. When the app does work, it’s wonderful. Layout makes topics easy to find, etc. Interesting that this App scrapes my web browsing from my phone to support its ad campaigns. Even more interesting is that I browse all sites using private browsing? How do they do that? Seems pretty sneaky and invasive. I don’t like it and deleted the app. The app freezes all the time. I open it and can’t do anything. Can’t you fix a simple problem like that?? This used to be my go-to app for local news. I’m gonna have to go with the other station’s app now. Like other reviewers, I have been attempting to read an article and it’ll crash completely. I remember the app being very easy to use before the video preview thing was added, so I was keeping it and trying to use I daily, staying hopeful with every app update that the issues would get resolved. Nope! Bye. Given that I value Kare 11 as my go-to news source for MN it is beyond words how consistently frustrating this app is. Basic attempts to read news stories, or watch news segments, are frequently met with full app crashes. The design overhauls on the app seem to favor adding flair, rather than ensuring function. 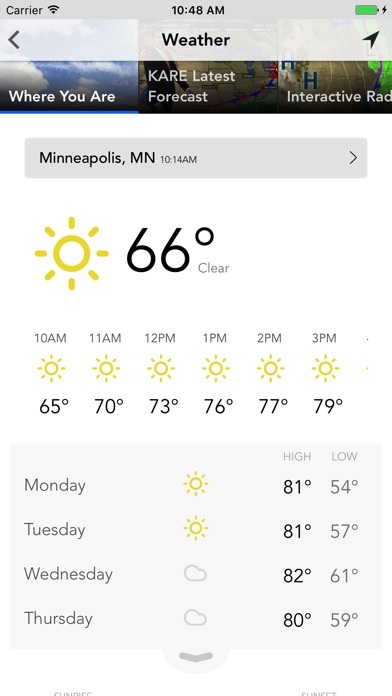 And don't even bother with the weather radar, depending on the version of the app there's a pretty good chance that there will be an ad completely blocking your ability to use the radar controls rendering it useless. Worst app on my phone that I still try to use. Crashes every couple minutes, jumping to the top after a few seconds. Just terrible. Have been watching forever, love this station! Each iteration of this app has new problems. It’s just not good from a user experience perspective, or performance. For example, why make me scroll through the articles with giant pictures? And, if you’re going to do that (which my husband actually likes), then at least have the app not randomly jump back to the top of the page while I’m looking at headlines. I watch kare11 as my normal news source but your app blows. And, some of the ads and clickbait are extremely inappropriate. I know the news isn’t always “family friendly” but you don’t have to this type of advertising in. I think less politics is the way most people are wanting to hear new ! Good content, but every video starts with a 30 second ad. Not to mention all the other ads on the page. No thanks. Used to love this app now it never works! Nothing ever loads, fix it please! Frustrating to get to the news. Have to scroll through way too many ads. Too many advertisements and pop ups placed in between story lines. Lots of glitches...very slow since past few updates. Are use it as a good source of local news and keeping up to date on the headlines. Editing needs a little work. Used to love this app. It was my go to for local news. Roll back to prior version without videos and I’ll come back. So sad. I have selected no on I think every push notifications and my phone is still pinging me 3-5 times a day. If this does not become more user friendly my wife and I will be removing the ap. Love KARE 11 but stop the push notifications or let us truly opt out of them. Since recent update, seems glitchey. Stores take a while to load and app is just generally slower. Maybe cuz of video previews? Used to love this app. Not so much anymore. I really liked when you could “swipe-right” and get to the next story. Wish you would bring that back and I will give you a 5 star. I live in Az. 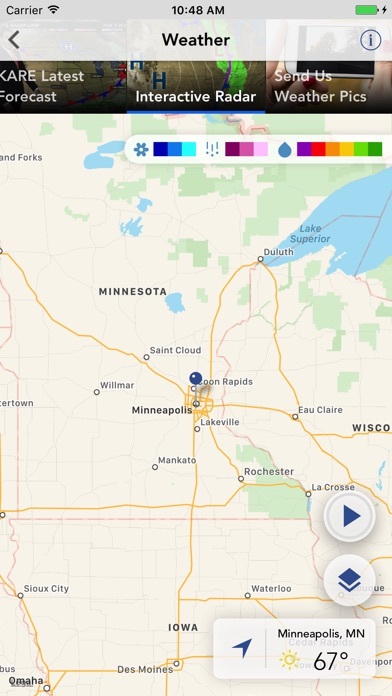 Have the Jare app as well used live in Mpls. I find the sports a bit lacking in that no Lady Gopher scores.. sports extra is dated 10/23. So I give a score of B.. B+. I love this app. It crashes a lot unfortunately and I have to reload but I check this app multiple times a day. Do not like the latest update which completely changes the way news stories are viewed. Somewhat confusing. Preferred scrolling right to left or vice versa. Will probably use another news app with the view I am accustomed to. Until they fix the notifications in this app, it is absolutely worthless. Doesn’t matter which notifications you sign up for, you will get notifications for anything and everything. Ever since TEGNA media took over KARE 11 here locally, their applications and website formats are absolute garbage. Everything is click bait titles, it’s so annoying. 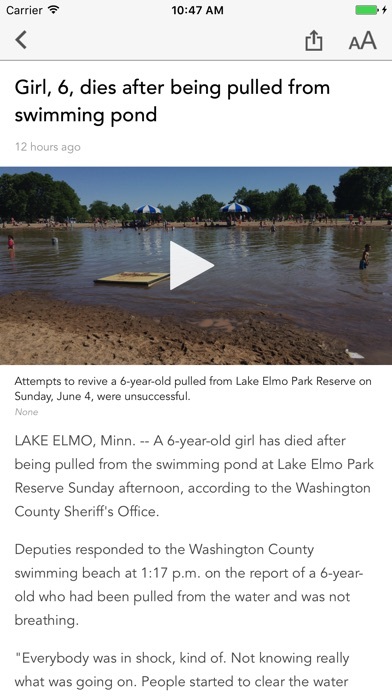 Quickly losing faith in KARE11 as a whole because of these format and worthless news titles. A lot of stories refer to videos or photos with no links to the actual video or photo. It’s happened repeatedly over the past few years. Sure they show more news items. I counted ten ads. While I am reading it scrolls up so I have to look for the story I wanted. Dropped it to a ONE with so many USA Today hit pieces against conservatives. 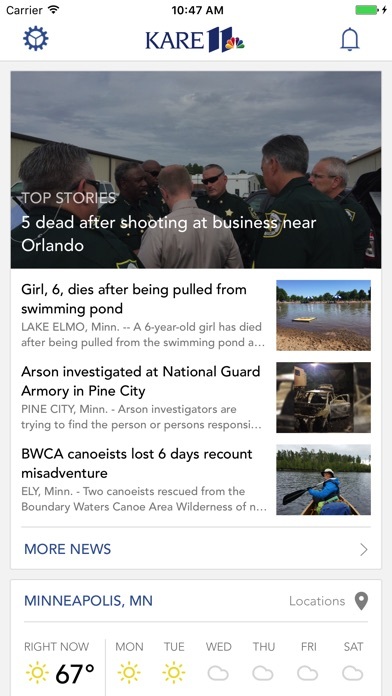 If I want to read USA Today I will go to USATODAY.COM Typically 12 news stories on main news page which is not very many. Still no updates on Sat Sun. Hire someone to do it. Changing the age (hours) of the story is cheesy. Nothing special and now less local news. It used to be good. Now video advertisements pop up in the middle of reading an article or even when I try to leave feedback on their Feedback screen. I don’t even touch my phone and they pop up every few seconds. Very irritating. KARE doesn’t pay much attention to St. Paul. 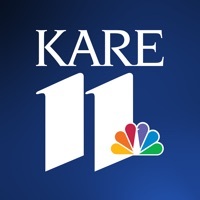 Stories hit National news before KARE picks them up. They need to pay more attention to new and less on Prep Sports.